Fill a large pitcher halfway with ice. Add peaches, honey, peach nectar and bourbon to the pitcher and stir well. Top with lemonade and stir once more to mix. Serve and enjoy! 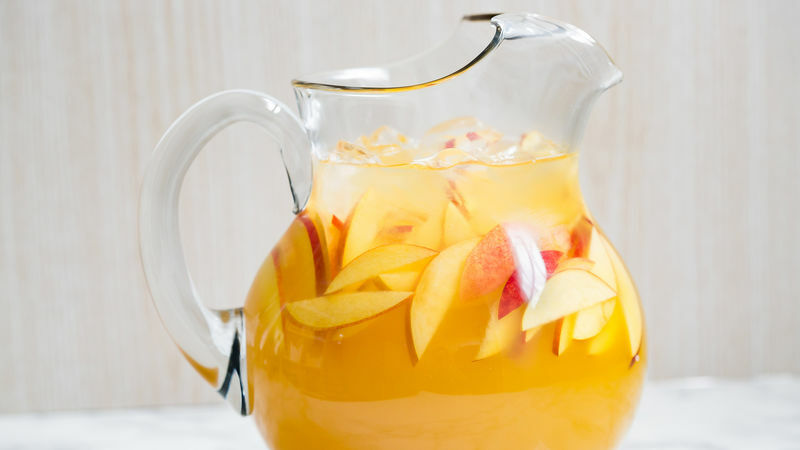 If you love the flavors of Southern peaches and summertime, this drink is for you! Sweet peach nectar is stirred together with smooth, caramel-colored bourbon, then spiked with lemonade for a refreshing pitcher of ice-cold goodness. One of our most favorite twists on lemonade, this easy drink is perfect for parties and a great way to extend the booze budget. Stretch the bourbon with peach nectar and lemonade, and generously refill glasses all night long. Pair this drink with any of your favorite grilled eats. It goes nicely with grilled chicken, steak and pork. Serve with a side of corn and tomatoes, or a zesty summer pasta salad. Serve it up in all glasses with tons of ice, garnished with a few slices of peach or nectarine. So good, so Southern, so tasting of summer, you may never want to stop sipping.